Nephritis may defined as the severe inflammation or swelling of Glomerulus. This serious inflammation is responsible for making kidneys incapable of flushing out harmful toxins and wastes out of body. Due to this condition both frequency and volume of urine is reduced. As we all know two bean shaped kidneys are very essential and vital organs of body that contains infinite neurons which are helpful in the process of glomerular filtration. It helps to purify our blood and collect harmful toxins and wastes and excrete them out of body in the form of urine. Nephritis is a condition that is divided into two sub types- Acute and Chronic Nephritis. Mostly Nephritis is caused due to mistake of body's own immune system. Any type of infections, drug reactions, allergies and injury to renal system may also be a reason for causing this disorder. In some cases, our body's own antibodies are damaging our renal cells and in other cases, family history is also major reason for this disorder. According to Ayurveda, kidneys are the made up of rakta and medha dhatu and are the major source of Medovaha Srotsa. So it is major disease associated with rakta and medha dhatu. Mutravaha strotsa are the major channels that helps to remove urine out of the body with help of kidneys. In this condition serious shotha (inflammation) blocked the minute channels of kidneys that is responsible for excreting waste products to mutravaha srotsa. 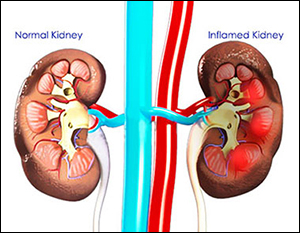 To treat this disorder, according to Ayurveda, one needs proper management and effective herbs that works naturally on kidney cells and reduces inflammation and improves renal strength. 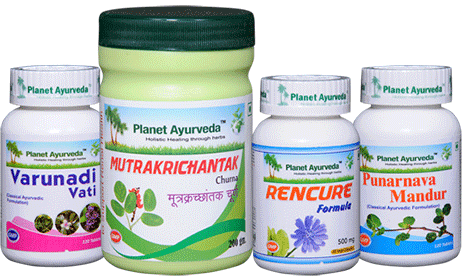 Beneficial herbal supplements are available at Planet Ayurveda to treat this disorder naturally and without any side effects. These herbal remedies work wonderfully to reduce the underlying factors that are responsible for causing this disorder. Best and pure quality of herbs are used in the preparation of these herbal remedies. Varun is the only pure and effective herb used to prepare this wonderful supplement in form of tablets. Pure extract obtained from Varun is used in the production of this wonderful supplement. Varun works effectively on various problems related with kidneys. It naturally reduces inflammation and pain associated with kidneys. It is also beneficial for kidney stones and to reduce severe pain caused by renal stones. It helps to fight against various free radicals and toxins that are harmful for kidneys. It is effective formulation used to promote overall health of kidneys. It is wonderful supplement that works to prevent and treat urinary tract infections. Stones are the major cause of blockage of kidneys that leads to serious inflammation and pain. This miraculous formulation is super solution for various problems associated with kidneys. Moreover it has no any side effect and it is also safe for lactating and pregnant mothers. Herb Varun is also very beneficial for reducing urea and creatinine naturally. Dosage: 2 tablets thrice daily with plain water after meals. Punarnava, Varun, Gokushur, Plash and Kansi are the various medicinal herbs that are used to prepare this wonderful formulation. All these herbs used in this product works wonderfully on balancing three important body doshas- Vata, Pitta and Kapha. Mainly it helps to pacify vitiated pitta and kapha dosha. Punarnava used in this herb is very effective diuretic that helps to increase the volume and frequency of urine. Its name explains itself that it helps to rejuvenate the weak cells of kidneys and also helps to repair other body organs. Punarnava is natural cleanser and very effective herb for treating kidney related disorders. Varun helps to treat urinary tract related infections and also good for renal stones related problems. Gokushur is also diuretic in nature that helps to reduce inflammation and also very good for increasing the volume of urine. Palaash and Kansi are also effective herb for acute and chronic problems associated with kidneys. Both are miraculous alkalizers that helps to reduce painful micturition. All the herbs used in this wonderful formulation are helpful in improving the overall strength of our renal system. Dosage: 2 capsules twice daily after meals with plain water. Varun, Punarnava, Gokushur, Kaansi, Bhumi Amla, Shirish, Shrigu and Apamarg are the herb used to prepare this fine and effective powder. All the herbs used in this formulation are good for sufferers of nephritis because these herbs are used to reduce inflammation and also used to remove toxins out of kidneys that are responsible for causing nephritis. All the herb are used to increase volume of urine and helps to lower extra urea and creatinine in body. Herbs used in this supplement reduces inflammation and pain naturally. All pure herbs are used in this formulation that do not have any side effects on our body. Dosage: Boil 1 teaspoon of powder in 400ml of water until it remains 50-60ml. Use regular tea strainer to filter this preparation. Take is twice daily after 45 minutes of meals and you can prepare it fresh every time for its better effects. This product is again very effective diuretic and good for the overall kidney health. Punarnava, Shunthi, Pippali, Marich, Amalki, Haritaki, Chavya, Haridra, Vidanga, Chitrakmool and Madoor Bhasma are used in the prepration of this supplement. All the herbs used in this formulation are good for treating underlying symptoms of Nephritis. Haridra used in this preparation is very effective anti-inflammatory herb that is beneficial for reducing inflammation which is major sign of Nephritis. Diuretic nature of herbs helps to remove harmful toxins and radicals by increasing volume and frequency of urine. It helps to repair damaged kidney cells and used to promote natural health of kidneys. Above mentioned pack is very beneficial for Nephritis patients. All the herbs used in this pack are natural, pure and effective extracts. It not only promotes kidney's health but it is also good for other body organs. It has no side effects and works naturally on body disorder. No preservatives, binders and adhesives are used in these products. These products are safe to use and gives very miraculous results.